Among the specialty breeds that Rachel hatched last spring are some Croad Langshans. The breed originated in China and was brought to Britain in 1874 by Major F.T. Croad. They are a large breed and lay dark brown eggs – at least the hens do. The roosters just strut around looking handsome. 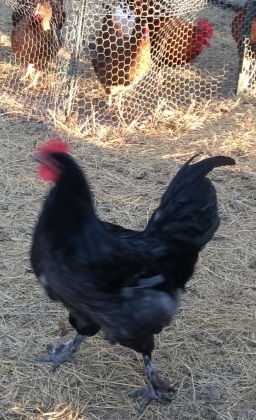 We have one black rooster who does just that until a hen comes around. Then he runs away. Rachel decided to name him Custard after the dragon in the Ogden Nash poem. The poem is one my mother read to us enough times that I still have most of it memorized. 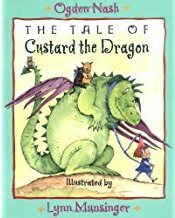 It tells the story of a cowardly dragon named Custard who gathers enough courage to gobble a pirate. I found the book at a used book store. We have many animals on Miller Farm. We may not have a dragon but we have Custard the Rooster who is just as cowardly and lovable.